Microsoft (NASDAQ: MSFT) will make use of K5 security guard robots to beef up their Silicon Valley Campus security. The security guard robots stand about 5 feet tall and weigh 300 pounds. They will act more as advanced mobile monitoring units to help aid human security in the event that trouble is spotted. The robots were manufactured by Knightscope. The K5 robots are not designed to apprehend or engage in combat. Instead, the androids are equipped with multiple technological features aimed at improving area coverage and surveillance. To give you an idea, each robot can reportedly read up to 300 car plates and keep track of faces it comes across. They can track other K5 robots on duty as well. So in the event that trouble is spotted, the robot sounds off an alarm and/or alert human security to the area of concern. The robots can be of great help to humans as well. In the event a human would need help, the unit comes with a button at the head can be pressed down for assistance. With regards to how long each robot can last, the units are good to run for up to 24 hours via single charge. It only takes just 20 minutes for each robot to recharge fully and return to the field. On concerns about each unit possibly drying out their batteries, each has been programmed to return to the charging station once their battery levels become low. At the moment, Microsoft has four of these K5 robots, these were robots that were being shown as part of a demo at conference that took place on Microsoft’s campus, and are not being deployed by Microsoft at the current moment in campus premises. 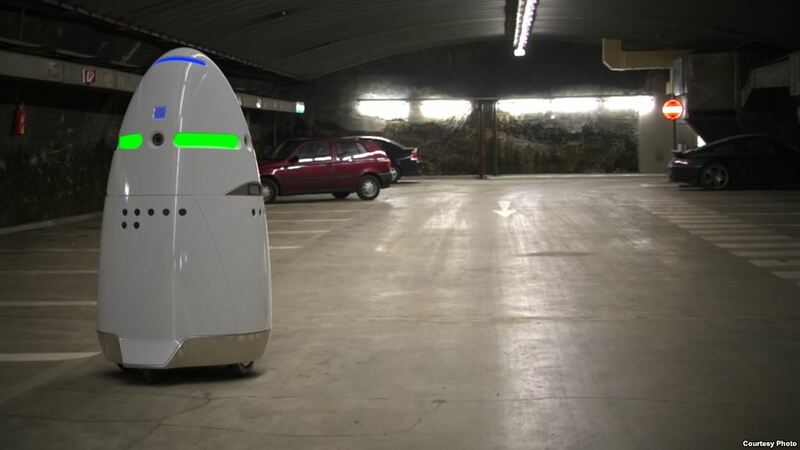 More companies are said to be on the waiting list for these K5 robots that are expected to enhance area security. Auto-mobile hardware and software platforms for security systems are a great place to experiment with alternative sensor suites, alternative WiFi links, alternative AI support from the cloud. What did the robots sense and when did they sense it? How fast can they upload evidence to the cloud? and then: to corporate security, local police and local DA? A random idiot may choose to kill the auto goalie on camera while at least 110 ultra high definition multispectral frames (at 1000Hz) are uplinked, but they’ll put out criminal movie-mugshots and a chain of evidence secure file to the county DA in the blink of an eye. In weapons research there is a concept called salvage fusing (the bomb goes off before it can be killed). Salvage prosecution is coming and it does not require any robotic weapons.